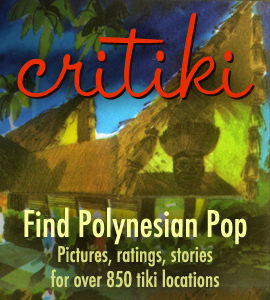 Outside of the United States, tiki bars have a double hit of exploration: Polynesian Pop gets mixed with a big dose of Americana. That’s the case at Tiki Bar Head Hunter, in Okayama, Japan. Head Hunter is a pure celebration of mid-century American Polynesian Pop, a small space that’s decorated with all the things you want to see in a classic-style tiki bar: bamboo, pufferfish and float lights, thatch. Mookie Sato has created some enchanting artwork for the bar, to boot. I’ve added Tiki Bar Head Hunter to Critiki… but I did it with a LOT of help from Google Translate. If you know your way around Okayama (or even just the language), could I ask you to check my work? The address could almost certainly use some formatting and accuracy tweaking, the description of its exact location could use some help, and I’d like to double-check the pin placement on the Critiki Map, too. And as always, if you’ve been there yourself, please share your pictures, ratings and stories on the Critiki page for Head Hunter!